Video game skills and a good poker face online are becoming essential job qualifications in the financial markets, with recruitment drives assessing potential star traders in online gaming exams. This is especially true where electronic trading arcades have replaced traditional trading pits. 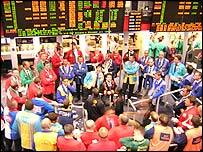 On the noisy floor of London's International Petroleum Exchange, boisterous pit traders strike deals for Brent crude futures under the time-honoured "open outcry" system. "You've obviously got to be cool under pressure" said one trader, "and mentally alert. But I wouldn't have thought training people on GameBoys would help you down there." But those game skills, developed despite parental fears for their offspring's social development, are exactly what is required for a lucrative future on the digital trading floor. At Geneva Trading, based in Chicago, they train up students to make money out of anything from Brent crude to precious metals and pork bellies. But as the company's president, Mary McDonnell told the BBC Go Digital programme, they are looking for recruits with a new generation of job skills. And part of their assessment process involves studying an applicant in a video game exercise. "It is unlikely that we would hire someone who didn't show good proficiency at a GameBoy or online poker or similar video-type game where hand-to-eye coordination is important" she said. The company follows small fluctuations in the market, easily missed on a bank of trading screens filled with fast moving numbers. Here, traders use mouse clicks to buy or sell. The faster their reaction the more money they can make, which is where the video games skills come in. This new job requirement is part of a trend throughout the financial sector, with some trader training courses offering an online gaming component. For Geneva Trading and other similar firms, expertise in online poker is another star-quality in potential recruits. "It's the discipline of not getting too emotional about your transactions, and also the mathematical ability to keep track of numbers, as in card counting," said Ms McDonnell. 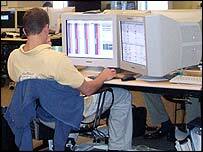 "Online poker practice helps traders to read the markets correctly. "It helps to determine if people are bluffing, trying to make the market move one way or another," she said. Away from the million dollar salaries of financial traders, the world of academia is catching on to the value of online gambling in the workplace. Professor Mark Griffiths is a gambling expert at Britain's Nottingham Trent University. He says poker online, or the old fashioned sort, offers many lessons for success, even in non-mathematical lines of work. "Poker-playing managers will be used to asking, 'did I play that right? ', and equally are likely to be more objective in reviewing the decisions they make," said Prof Griffiths. "They may be more pragmatic than others, as playing with the cards you have is a winning strategy in poker. And top poker players are insatiable in their desire to win. "Being this focused is an important leadership skill in the workplace. Then there's the art of deception, not normally seen as a desirable skill, but in poker it's all part of the game." "After all, in many workplace situations the ability to get away with white lies, to save face or be diplomatic, or to smooth over or disguise mistakes and errors, is a big advantage."